Not only that our last firing was quite successful. 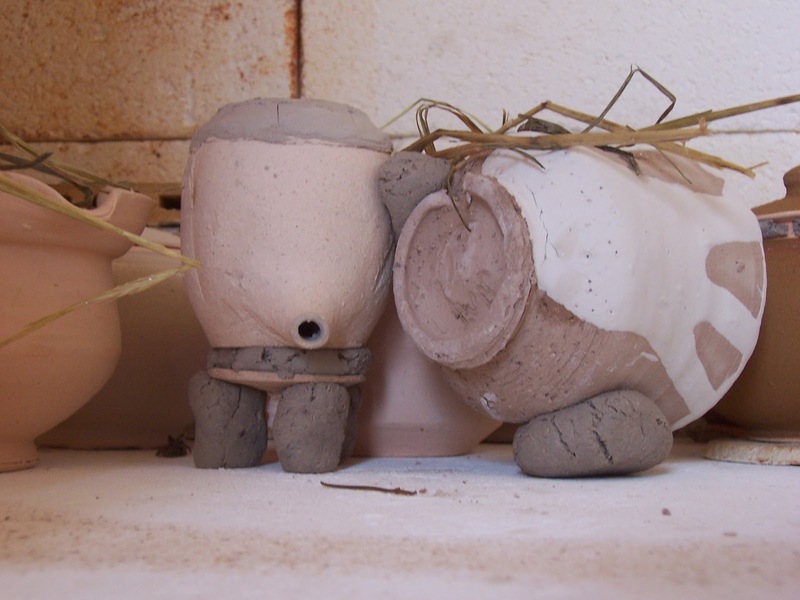 Not only firing with new horizons of charcoal firing experience. But it was also the last firing of the year. 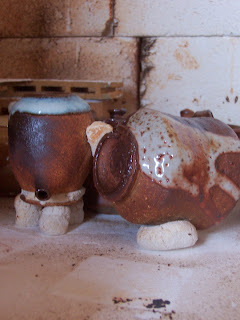 When the kiln was unloaded and pieces were step by step cleaned - there was time to celebrate, time for tea. For this festal moment I have dug in to my wooden box with tea samples and find something really special - PinLin oolong from 70's which was send to me from The essence of tea few months ago. When I opened package and find out that there is "the exact" amount of tea leaves need for the celebration – so the tea has been chosen. I choose small porcelain tea pot- 80ml was the right size for amount of leaves I had. 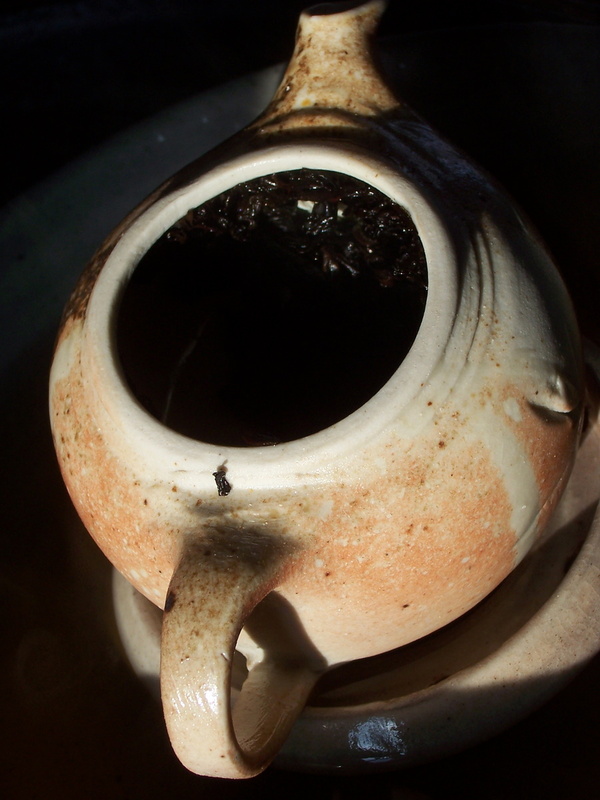 The charcoal from firing have leave black and brown painting on this porcelain teapot- the aged felling from brand new piece. 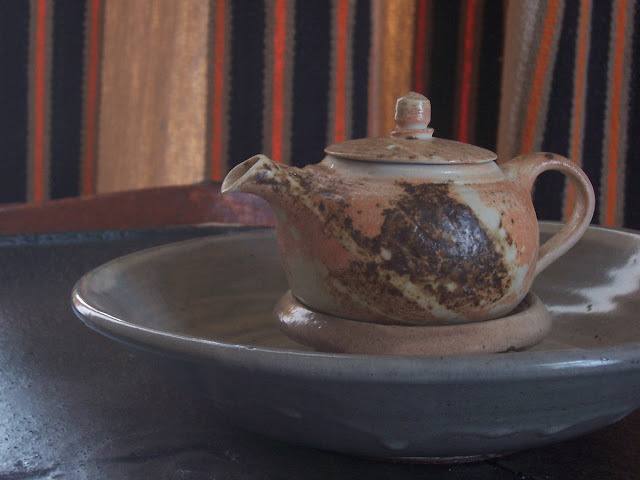 Flames colored the unglazed body of the porcelain tea pot to salmon. For this kind of tea I like to use longer times and smaller amount of tea leaves. 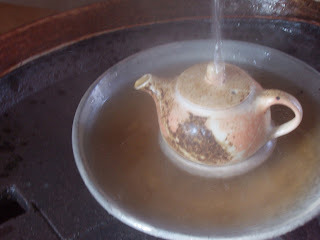 I use small tea boat where tea pot can swim. 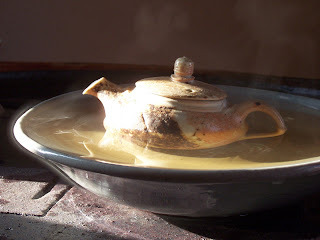 I pour hot water on the teapot to keep the tea infusion hot. About ten minutes of the first infusion and even more for ensuing. 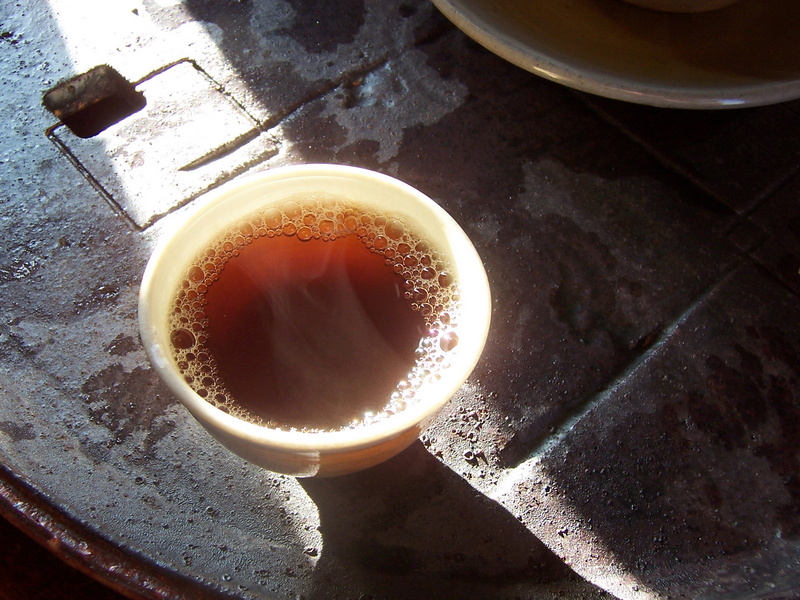 Waiting, smelling, smiling... playing with the hot water and watching variations of colors on the Mirka's tea boat. When I try to describe a tea I find, time to time, much easier for me to personify it. I find to more important to describe personality of the tea then its separate tastes and fragrances. There is a wisdom grown up from experiences and years, not bitterness of old age but rather smile of those who know. And in spite of it the person stays ordinary, without superiority…honest but with deep purity. Beauty of intellect. When I was almost finished and started to examine leaves I find pleasant Puer like fragrances and I have started to feel as I met interesting man and he could show me much more if I was ready to see...hopefully we will meet again. nice post, seems like some great oolong and beautiful peaces of tea-ware! Congratulations on successful firing. Congrats on the charcoal firing! I hope not so many pieces got damaged (if any). 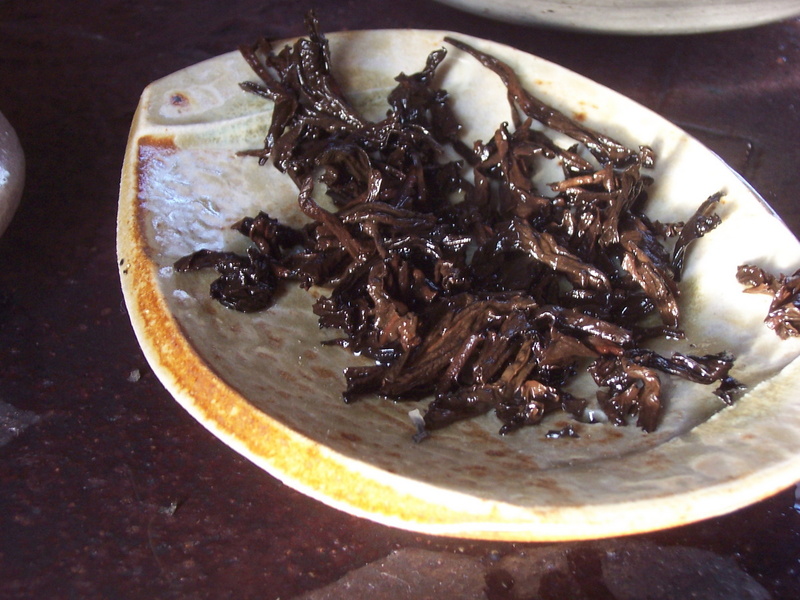 Very nice story about your oolong. What is that steam coming out of the tea pot on the third picture - just curious? Vladimir- Only two cups stick together as we tryed to put charcoal around them. So it was really almost nothing. On the third picture you can see pouring hot water on teapot and steam around it. When you click on it, it will open as quite big picture so it will be clearer. I love the theme of your blog , it goes well with your posts. 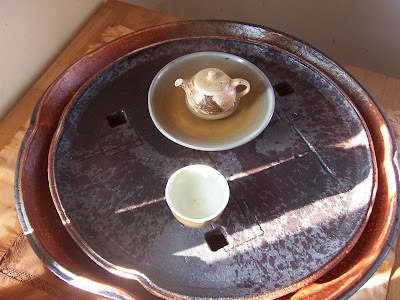 I also love hving tea and collecting tea pots. Thanks for sharing. Merry christmas to all. This is the best way to celebrate a christmas with traditional things. I also like to do the celebrations simple way.